So, last week I got some raw milk from Joe Rush. 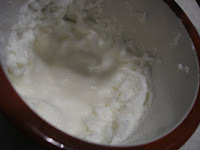 There is a good bit of controversy over the safety of raw milk (see, for example, this article about a new California law http://www.mercurynews.com/ci_8472500, what the FDA says http://www.fda.gov/fdac/features/2004/504_milk.html vs. what the Weston A Price foundation says in response http://www.realmilk.com/documents/SheehanPowerPointResponse.pdf). Many believe that raw milk from cows that are grass fed can be beneficial because of certain enzymes, vitamins and helpful bacteria that are present-- which are destroyed by pasteurization. The thing about raw milk, though, in addition to being unpasteurized, is that it is unhomogenized. The fats haven't been distributed throughout the milk. Instead, they just rise to the top as cream. Joe Rush's milk is from grass-fed Jersey cows and has a very high percentage of butter fat. 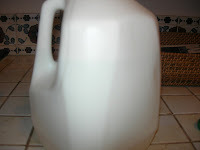 If you squint really hard and use your imagination, you can see the line where the thick, pure white cream starts about 2/3 of the way up the jug. It is there, it just didn't photograph well. 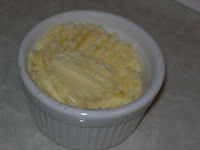 After hearing that someone had used this cream to make butter, I decided that was too crazy not to try. I mean, make your own butter? Wow. And apparently, it wouldn't be that hard. Hmm. 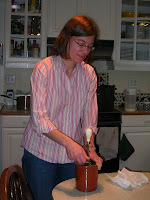 So, a friend loned me her butter churn, which is a crock with an egg beater attached, and told me what to do. I enlisted my other friend to help who had made butter before. First, I needed some way to get the cream out from the milk jug, so I figured I would pour all the milk into something with a wide mouth. First, I tried to sterilize a glass sun tea pot/ pitcher that I had bought at Target. I boiled some water, let it cool a few minutes and then poured it into the pitcher. The pitcher promptly cracked beyond repair. So, instead I used the large pot that I had boiled the water in and poured the milk into there. I have since realized that using two see through 1/2 gallon orange juice/ kool aid/ lemonade pitchers would be wiser. But anyway, I let that sit in the fridge for about 18 hours or so. The next day, I sterilized the equipment (the crock and egg beaters) by putting them into a canner filled with boiling water. Shortly after I took them out, I put them into the freezer. Not a good idea. The crock cracked. Very slightly, but still. And it isn't mine. Sorry! So, the moral there is, sterilize the night before. Let the crock come back down to room temperature. THEN put it into the fridge overnight (which is actually what my friend had told me, but I didn't read her instructions until it was too late). I tried that for a good, long time. Maybe 20 minutes? Still, no butter. More frothy cream. After reviewing another website (http://www.travelerslunchbox.com/journal/2007/6/21/getting-some-culture.html) and still no answers and no butter, I had to help put the kids to bed. I left the butter out, and by the time I finally got back downstairs, I may have inadvertently cultured the cream a bit. It kind of smelled like baby spit up. But, I remembered what my 7 year old always tells me, "Mommy, if you believe in yourself and really try, you can do it." I don't believe in myself, really, but I do believe in my Kitchen Aid. 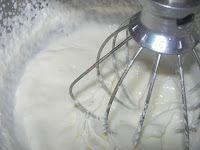 I let it whirl away for a while longer, alternating between very high and very low speeds, and before I knew what was happening, buttermilk was splashing over the sides of the bowl and I had butter! I poured off the buttermilk (and saved it for making pancakes), washed the butter, and kneaded it with a fork until it seemed like all the liquid was gone. I added a bit of salt (I have no idea how much), put it in this nice ramekin, and covered it with plastic wrap (I know, I know, but I haven't yet removed plastic from our lives). Butter! I have no idea how my Kitchen Aid did it, but it did. Think it would make a good children's story? "The Kitchen Aid that Could"?